The words came from Enda Kenny just hours after the Brexit earthquake struck 500 million EU citizens early on Friday morning. Those words conveyed noble sentiments and were a pithy summation of the extraordinary challenge facing this and future Irish Governments. It will be well-nigh impossible to achieve. The road has forked and Ireland will be pulled violently in opposing directions. It will take a “Houdini act” to ride the EU and UK horses as they head in polar opposite directions. Mr Kenny was quick to side with the British Prime Minister, David Cameron, who is himself exiting the political stage, albeit ever so slowly. The Taoiseach disagreed openly with his pal, the EU Commission President, Jean-Claude Juncker, who said that uncertainty surrounding the UK’s EU status must be sorted out as quickly as possible. Juncker rejected Cameron’s idea that, in practice, the other 450 million citizens should wait for the British Tory party to sort out its internal strife, and choose a new leader by October, before anything else happened. The Commission president’s impatience with Cameron’s stance is reflective of a growing impatience with Britain in Brussels and many other EU capitals. It is also Juncker’s duty as the guardian of the EU treaties to speak thus. His view was echoed by the foreign ministers of the “original EEC Six” founding nations, who rather ominously met in Berlin on Saturday, and voiced very strong words along the same lines as Juncker. But the Taoiseach does appear to have got himself on the right side of that row within a row over the timing of Brexit talks kick-off. By today there is a preponderance of opinion leaning towards taking this one slowly. 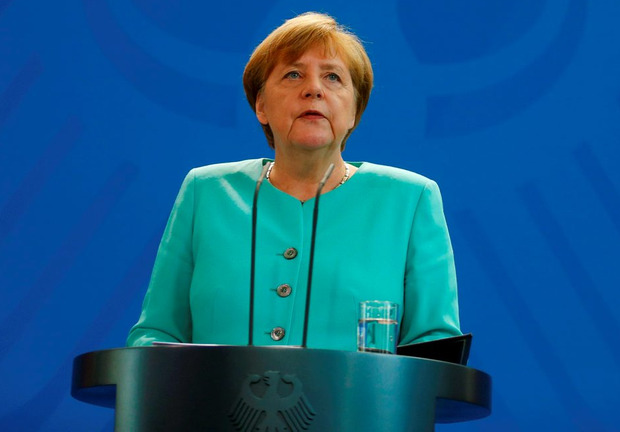 Most importantly, German Chancellor Angela Merkel said she saw no rush and that timing was in the UK’s hands. In reality that probably sorts that one. But you can add Dutch Premier Mark Rutte, who is the current EU Council president, and EU Commission chairman Donald Tusk to give it extra ballast. Noises off around the need to speed up the Brexit will, of course, continue, especially from more ardent EU integrationists in the European Parliament. But we are in all likelihood looking at an autumn start for these tangled talks which could take a long time to complete. That is not good news, as it risks fuelling instability. For now the Irish Government is obliged to talk up as much stability as it can. The continued stress is on how nothing will change for some two years. And the additional claim that there is, somewhere, a cunning plan to deal with all contingencies. But already in Brussels some brutal realities are unfolding. The resignation of Britain’s EU Commissioner, Andrew Hill, on Saturday followed moves by leading groups in the European Parliament to call for his dismissal following the referendum Leave vote. Hill had been given the key responsibility for financial services in Juncker’s tip of the hat to the importance of the City of London. When you consider how Cameron tried to block Juncker’s appointment as commission president, alongside a very personalised and negative British media campaign in 2014, that was a generous move. But it was to no avail. Two other straws in the wind also point up the “here’s your hat – what’s your hurry” in the approach of other member states, and diverse EU elements, to Britain’s EU exit and its timing. The first is that the UK’s six-month EU presidency stint in the second half of next year has been scrapped. The second is questioning the status of Britain’s continued EU Court judges’ terms of appointment. Some of these were due to serve until 2020 and are currently handling some important cases. That is all just another example of the tens of thousands of issues to be covered by Brexit and related talks to establish a new EU-UK relationship. It can well be argued that Ireland is the most exposed economically and politically here. But do not expect too much sympathy from the remaining member states, who are facing their own rather pressing concerns. For Germany there is the fear that the whole EU project is now perceived as under threat. For France, Austria, the Netherlands, Finland, Denmark and Italy, there is the continued rise of anti-EU groups who are jubilant at the British referendum outcome. For the Czech Republic, Malta, Spain and Belgium, there are significant trade issues and economic fallout. Greece benefited from easier economic terms to avoid any flare-ups during the British referendum campaign. That, the Greeks fear, may change now it’s over. Spain, like Ireland, also has a border issue involving Gibraltar. All of that is just to say that Ireland is not the only one with serious problems arising from Brexit. But this country’s difficulties may be compounded by a rise in country-to-country dealings and a weakening of the policy-guiding commission which has a record of trying to defend smaller countries’ rights. The meeting in Berlin on Saturday restricted to foreign ministers from the “original six” is just one example of a growing trend. If the trend towards “inner core” and “outer core” continues, Ireland’s dilemma will intensify.